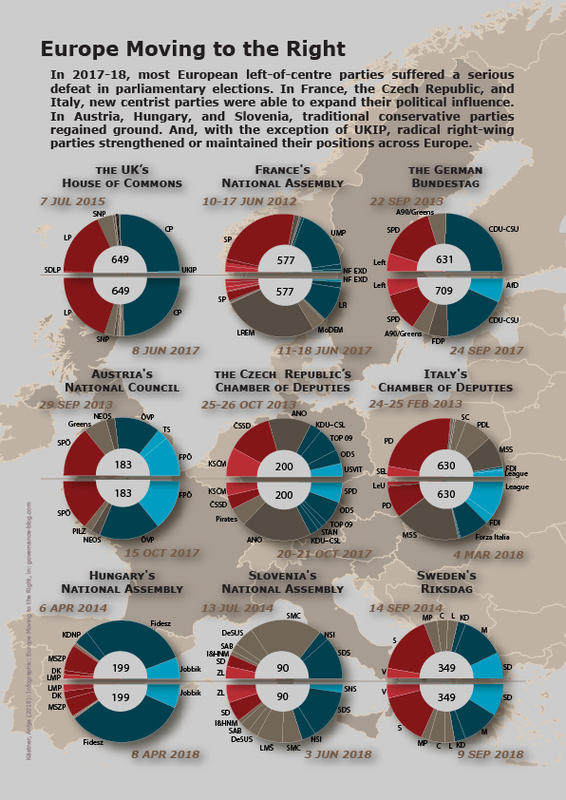 28/10/2018 0 comments on "Infographic: Europe Moving to the Right"
In 2017-18, most European left-of-centre parties suffered a serious defeat in parliamentary elections. In France, the Czech Republic, and Italy, new centrist parties were able to expand their political influence. In Austria, Hungary, and Slovenia, traditional conservative parties regained ground. And, with the exception of UKIP, radical right-wing parties strengthened or maintained their positions across Europe. Europe is moving to the right. This is the verdict when comparing the results of elections to the lower chambers of parliament in nine European Union countries to that of the previous vote. Starting with the early election to the British House of Commons on 8 June 2017, and ending with the election to the Swedish Riksdag on 9 September 2018, the infographic in chronological order contrasts the distribution of seats in the old parliament with that in the new one. Parties were mapped by their political conviction from left to right. Traditional social democratic left-of-centre parties are coloured in a dark red; more radical left-wing parties in a lighter red. Similarly, traditional conservative left-of-centre parties in a dark blue; right-wing extremist parties in a lighter blue. Moderates falling in neither of these categories were coloured in ochre. This includes green, liberal, and regional parties as well as independent candidates. Four trends exemplify, how Europe is moving to the right. First, traditional left-wing parties are losing popular support. Second, new centrist parties are gaining political support. Third, traditional conservative parties gain ground. Fourth, radical right-wing parties maintained or strengthened their positions. In France, Germany, the Czech Republic, and Italy, Social Democratic Parties suffered serious defeats. Most dramatically, France’s Socialist Party lost 21.9 percent of votes, dashing their representation in the National Assembly from 280 to just 30 seats. The Czech Social Democratic Party’s vote receded by 13.2 percent, cutting their seats in the Chamber of Deputies from 50 to 15. Italy’s Democratic Party lost 6.7 percent of votes, reducing their parliamentary seats from 297 to 112. The German Social Democrats had to surrender 40 seats in the Bundestag after losing 5.2 percent of voters. In a number of countries, a large segment of voters moved to support centrist movements or parties, many of which were only recently founded. In France, Emmanuel Macron’s La République en Marche convinced 28.2 percent of voters. Founded in 2016, the party won straightaway more than half of the seats in the National Assembly. In Italy and the Czech Republic, centrist parties gained ground that for the second time participated in a parliamentary vote. The Five Stars Movement increased its share of votes by 7.1 percent and more than doubled their seats in Italy’s Chamber of Deputies. Meanwhile, Andrej Babiš’ ANO increased its share of votes by 11.0 percent, boosting their number of seats from 47 to 78, making them the biggest faction in the Czech parliament. In Germany, the Liberal Democrats, who were not represented in the previous Bundestag, re-entered parliament, winning 80 of the 709 seats. While the old right-of-centre parties suffered a defeat in France and Germany, traditional conservative parties were able to expand their political influence in a number of European countries. The Austrian People’s Party increased their share among voters by 7.5 percent, making them the strongest fraction in the National Council. In Hungary and Slovenia, Viktor Orbán’s Fidesz and the Slovenian Democratic Party managed to expand their parliamentary influence. Finally, in a number of EU-countries, extreme right-wing parties were able to attract a growing number of voters, most dramatically in Italy, Germany and the Czech Republic. In Italy, the League expanded their vote by 13.3 percent, boosting their number of seats from 18 to 125. In Germany, the Alternative for Germany – that in 2013 had just failed to cross the 5 percent threshold, received 12.6 percent of the 2017-vote and subsequently gained 94 seats in the Bundestag. In the Czech Republic, the far-right Freedom and Direct Democracy won 22 seats in the 200-strong legislature. In France, Hungary, Slovenia, and Sweden, radical right-wing parties were also able to expand their political influence, even though to a lesser degree. In France, the National Front lost voters, but due to the first-past-the-post system still managed to raise their seats in the National Assembly from 2 to 8. Similarly, in Hungary, Jobbik lost 1.2 percent of voters, but still was able to secure 3 additional seats in the National Assembly. The Slovenian National Party entered parliament, securing 4 of the 90 seats. And the Sweden Democrats attracted 4.6 percent more voters compared to the previous election, raising their seats in the Riksdag from 48 to 62. In Austria, the far-right maintained 51 of the 183 seats in parliament. As such, the United Kingdom was the only country in which a right-wing radical party’s political influence declined. UKIP, which only held one seat in the House of Commons, was kicked-out of parliament.